If you are looking for a chili that does have bean in it I have a super easy chili recipe that you will enjoy. If you make either of these chili recipes when there is fresh snow on the ground I would shake up a few snow day margarita to go with your meal. How do you reheat beanless chili? I reheat beanless chili in a small sauce pan over medium heat. If a stove is not available, reheat the chili in the microwave in a microwave safe container on 50% heat for 1 minute, stiring half way through and heating until reaching the desired temperature. Can beanless chili leftovers be frozen for future meals? This beanless chili recipe is perfect for freezing for future meals. Be sure the chili has been cooled to at least room temperature by chilling it in an ice bath. Store in freezer safe containers removing as much air as possible to prevent freezer burn. 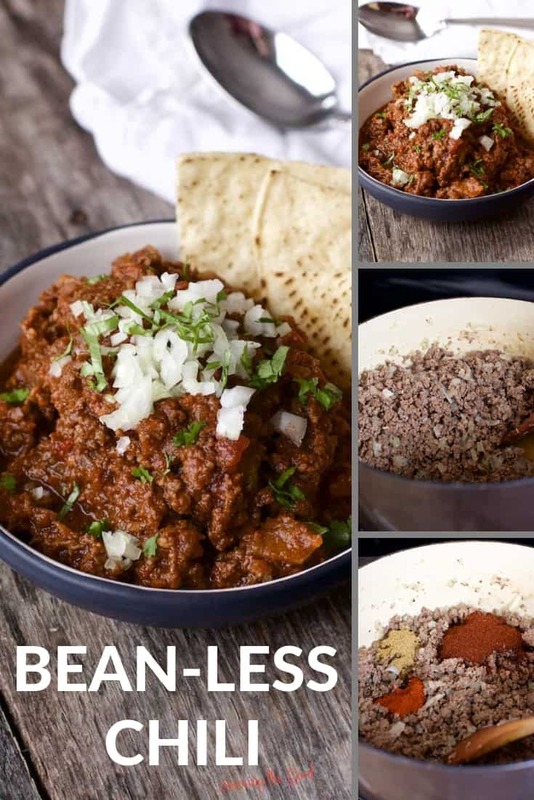 What do you serve with beanless chili? I love to pour beanless chili over baked potatoes, crips tater tots, french fries, or over a big piece of corn bread. There are endless options! What do you serve on top of beanless chili? I have this recipe spiced to my families taste but you might want a bit more heat. Here are some suggestions for you to kick up the spice in your chili. Add one or all all of them. This is YOUR chili. Make it to YOUR tastes. In a heavy bottom pan, brown the ground beef. Leave the rendered fat in the pan and saute the onions in the fat and meat. Skim the fat off the meat, if desired. Sprinkle in the seasonings and stir to warm the spices. Add 1 1/2 of the beers to the meat. Drink the other 1/2 beer. Add the tomatoes & diced chilies and the crushed tomatoes. Bring to a simmer and reduce for 30-45 minutes. Transfer to a slow cooker / crock-pot and cook on low for 4-6 hours or high for 2-3. If you love chili but don't love beans, this easy beanless chili recipe is for you! Full of protein and all the flavors of a traditional chili this easy chili recipe will sure to become a family favorite. Fantastic flavors! We love ours with a little extra heat – perfecto! We love our chili super thick like this and the hubby says beanless, please! He’s going to love this one and I’m thinking of making some amazing nachos with it. I can’t wait to try. Thank you for such a great recipe! You are going to LOVE it on Nachos.Glad I could share this recipe with you. Drinking the beer definitely got me in!!! Love it!!! I know! Right!? Got to test the ingredients for quality!